Mysuru: As part of International Yoga Day, six yoga achievers were conferred ‘Yoga Kalaratna Award at a programme. 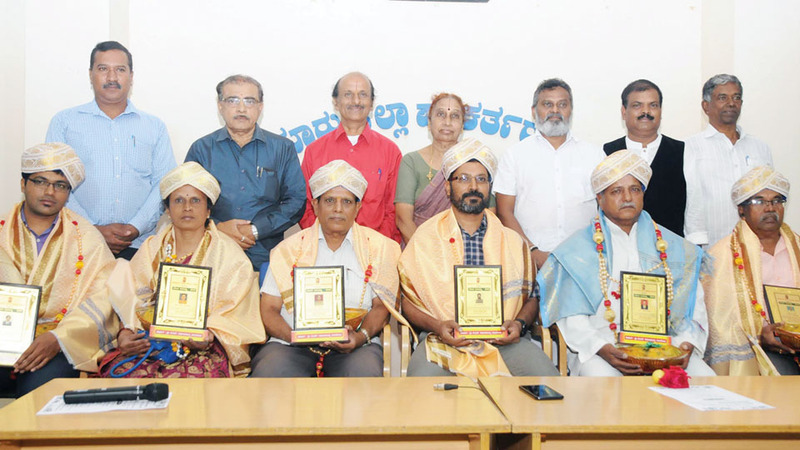 The event was jointly organised by Himalaya Kala Sahitya and Mysuru Yoga Samsthegala Okkoota at Mysuru District Journalists Association (MDJA) premises here yesterday. The Yoga achievers who were conferred the award are — V. Somasekhar, Ramesh, Sashikumar, N.R. Sandeep and K.R. Parvathamma, all of Mysuru and P.R. Vishwanath Shetty of K.R. Nagar. Veteran Social activist K.S. Raghuram, speaking as the chief guest, said that Mysuru can be considered as an Yoga kingdom as the city has contributed a lot for yoga promotion. Highlighting the role of Rishi Pathanjali in giving a new dimensions to yoga, he said that the erstwhile Mysuru ruler Nalwadi Krishnaraja Wadiyar promoted yoga education. Recalling the contribution of Yoga Gurus Krishnamachar, B.K.S. Iyengar and Pattabhi Jois in carrying forward the yoga legacy for generations, Raghuram regretted that with the passage of time, Yoga is getting commercialised. Himalaya Kala Sahitya Vedike Convenor Yogaprakash, in his address, said that there were over 350 yoga schools in city. Highlighting the role of Yoga in maintaining mental and physical health, he said that the District Administration should identify yoga achievers and honour them every year. Poetess Dr. A. Pushpa Iyengar, Mysuru Yoga Association’s C. Ramesh, N.R. Mohalla Sri Sharadamba Temple Vice-President M.L. Kalyan Kumar and others were present.